Take the Omega 80 on multi-day expeditions, backpacking, or peak bagging trip in the mountains. It brings together popular features and design details from generations of MEC packs – and offers phenomenal value too. Designed to carry lots of weight comfortably, it has adjustable suspension, contoured padding and lumbar support. The shoulders, hipbelt and back length are crafted to suit women's smaller, curvier frames. And it has lots of smart features to handle all your gear: pockets, hydration routing, a removable sleeping bag divider, plus a roll top and a spindrift collar. Made of durable high tenacity nylon with a water resistant finish and a reinforced bottom panel. 2 aluminum stays and PE board back panel transfer the load efficiently to your hips. Shoulder straps, hipbelt and back pad have soft EVA foam padding with soft stretch woven on contact surfaces for comfort and breathability. Lumbar pad is shaped to fit the contour of your lower back to support heavy loads. Sternum strap has a built-in whistle in the buckle. Shaped, curved hipbelt uses multi-density foam, and has 2 zipped pockets to hold snacks or your phone. Access the main compartment via the top spindrift collar, the side zipper or the bottom sleeping bag compartment. Spindrift collar closes with dual cinch cords or roll-top buckle. Removable top lid has 2 zippered pockets. Large zippered external pocket holds quick access items. Zippered internal security pocket for valuables. Twin stretch mesh side pockets hold water bottles. 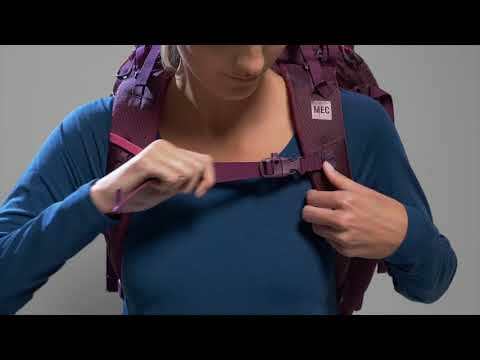 Side and bottom compression straps and mini daisy chains can be used to attach extra gear. Loops hold ice tools or trekking poles. Internal hydration pocket with hose port and tube holder elastic on shoudler straps. Hydration reservoir sold separately.